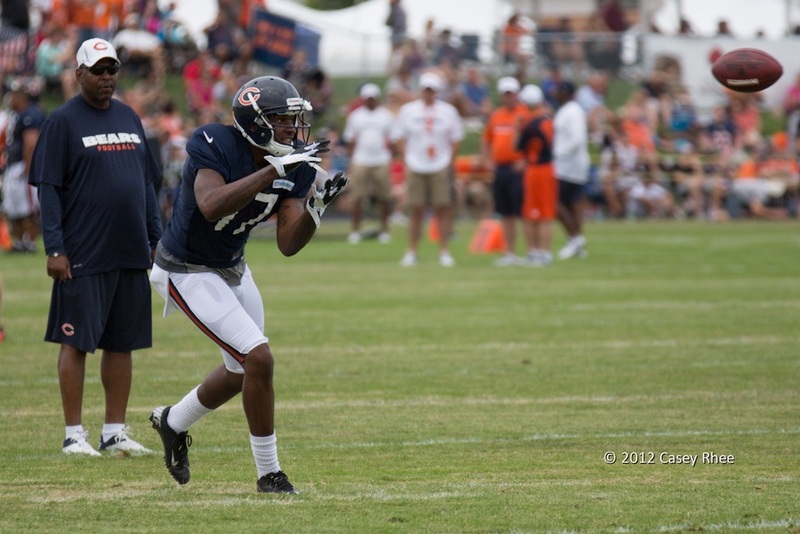 Alshon Jeffery showed all the potential to be a top-five talent at his position in the 2012 draft class. Photo by Case Rhee. How did I grade Alshon Jeffery in the 2012 NFL Draft? A potential cross between Michael Irvin and Cris Carter if Jeffery demonstrates he wants to work like a pro. Cris Carter-Michael Irvin is also a good best-case scenario for a player of Jeffery’s talents. However, where Criner has a dash of Marques Colston and more Carter to his game than Irvin, Jeffery has the strength and physical style that leans heavier to the Irvin side of the equation. Big, strong, agile, and powerful, Jeffery can make defenders miss in tight spaces and run through wraps. He has a good, tight spin move, that helps him continue moving forward in traffic. He also has the power and balance to bounce off hits delivered by much bigger defenders and he has little fear of working over the middle against physical coverage. Although strong and agile, he doesn’t run with great pad level and will be prone to taking hits that he should be able to avoid. His effort isn’t as high energy as it needs to be. The WR believes his size and strength is elite and doesn’t consider that his speed and quickness is not. He doesn’t appear fast and his gait is not smooth at all. He’s a long strider. Jeffery can high-point passes and over power defenders in tight coverage. He has enough build-up speed to threaten the intermediate range of the field. He’s especially good on fade and corner routes where he can use his height and strength to maintain separation and adjust to the football in the air. However, he’s also good at being first with his hands to prevent defenders from getting their hands into his body on quick-hitting routes like slants and short in-cuts. When game officials are willing, Jeffery will bully a defensive back downfield to establish separation. Jeffery should be able to develop very good hand techniques to release from the line of scrimmage, but right now they are hit or miss. He needs to work on his rip move and swim move. Frequently, the CB can ride him up field and eliminate quick throws. This is because he relies too much on his size/strength and he’ll have to learn more of a finesse game so he doesn’t incur penalties at the next level. He wins balls where it appears the defender has the better position with the ball in the air. His skill at tracking the ball is good and he has a basketball forward’s mentality to get the rebound. This is also where he reminds me of a Michael Irvin type of player – not really fast, but very physical with good timing. Jeffery has to do a better job of securing the ball immediately after the catch. Otherwise, he’s susceptible to getting stripped when trying to run with the ball before he has tucked it safely away. Although I’m not around Jeffery, it seems from his work on the field that if he dedicated himself to becoming a top-conditioned athlete he could become fast enough to get deep because the work will help him add explosiveness as well as strength. If he adds an extra dimension of foot speed to his game, he can develop into a versatile route runner and become a highly productive NFL starter for a long time. I think Jeffery has great potential to become a counted on, chain moving possession receiver with strong red zone skills, but only if he works at it and develops a high motor. At this point he doesn’t and that could mean he doesn’t endear himself to a team and risks never making the impact he’s capable. What he has shown at times in his career places him high enough on this list, If he demonstrated it consistently, he’d be be in my top-five, easily.